Hey there. If you play a lot of video games, you'll get reality and fantasy mixed up from time to time. You'll believe that you're still in the game even though you turned the power off a long time ago. That's why I really enjoyed the below poster. It's happened to me where I'm walking on a ledge to "avoid falling into a fire pit" or am clinging to a fence a la Super Mario World. It just makes the real world that more fun. lol So once I find out where I can purchase this sticker, I'm so going to get it. Later! Hahaha. 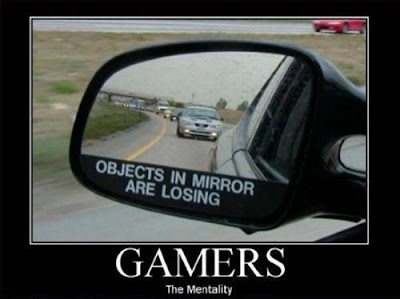 Than you will be driving around like you are in Mario Kart? Haha! Let me know if you do buy it, I am in for getting one too. Hey there. I think it's great! If only it came with some blue turtle shells and I'd be set!!! lol very cool! a must have! hope you managed to get one.